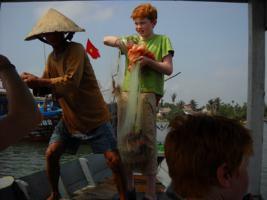 The travellers who come to the ancient town of Hoi An can now have a great experience at a local fishing village through a Hoi An Eco fishing tour,Farmer & Fishing tour,Hoi An Sunset or Hoi An Sunrise provided by Hoi An Philong Tours. Info : The tourists are taken by a roofed boat to Cua Dai Fishing Village. There, visitors are transferred to small boat owned by local fishermen and they experience a day in the life of a fisherman. They are instructed how to use a fishing net to catch fish , many visitors who have never tried this before, can make a good catch.